The imagery of some Orthodoxy hymns about the crucifixion of Christ, seem all too pleasant … Jesus falls asleep on the Christ. No mention of the agony and torture he would have suffered. Many icons reflect that same calm demeanor. It was Christian humanism of the Middle Ages which really took an interest in the suffering and agony of Christ and began to describe and portray the agony and torture which crucifixion is. Read the biblical texts and we see that the bodily suffering of Christ is hardly mentioned. It was the focus on Christ’s humanity which was seen as realism, that started Christians moving away from a focus on Jesus as the incarnate God. Instead of seeing God, all that was seen was another human dying a painful death. The image of Christ falling asleep on the cross is deeply rooted in the theology that God is passionless. God is not moved by emotions and their visceral affects on us – God doesn’t have a body so does not experience emotions like we do. God does not love us as a reaction to us for God is love. God dying on the cross does not change His reaction to humans: He continues to love them. And so Jesus says while dying on the cross, “Father, forgive them; for they know not what they do.” (Luke 23:34) He came into the world because of divine love and dies on the cross for the same reason (John 3:16-17). Christ doesn’t forgive in reaction to what his tormentors are doing for He came into the world as love in order to forgive humans. In Your compassion You humbled Yourself, and were lifted on the cross raising up with Yourself the one who had fallen of old through eating from the tree. Therefore, You are glorified, Lord, alone greatest in love, and we sing Your praises forever! God loves humanity and accepts that love means God will suffer for us humans. God suffers for us, with us and in us. God does this for our salvation. God is not changed by our sin, by our reaction to God, by our rejection of God, by our crucifying God’s Son. God is love. Thus the Passionless God suffers the passion as one of the great mysteries of God’s love. And because it is God on the cross, the suffering is infinitely deep, yet God is still love and God continues to act toward us in love. 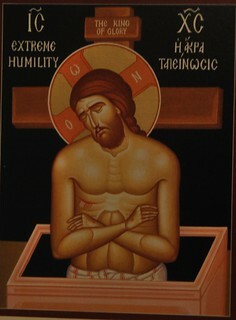 This is why the icon is so correct in portraying the sleeping Christ on the cross – divinity suffers in us and for us and with us in all eternity and yet this does not change God’s love for it is God’s love for us. God even takes on a human body and experiences all the pain, sorrow and torment of being human because this is God’s love for us. It is a love infinitely and eternally deep – yet it is the love that God offers to us and invites us to share with Him so that our life, and our suffering, becomes our life in God. God dying on the cross is still love, and still loving us. Christ lives and dies for Adam, Eve and each of us. The hymns of Lent often move from images of God dealing with Adam to God dealing with each of us. I have fallen into the heavy sleep of sin through heedlessness, but, my Christ, Who for my sake fell asleep on the cross, awaken me, that the night of death not come on me. 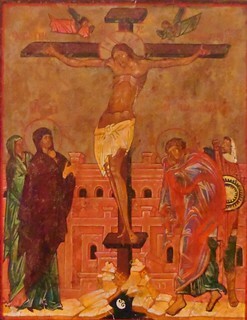 Christ’s death on the cross is the sign of the blessed Sabbath Day on which the Lord rests for His work for us and for our salvation is complete. 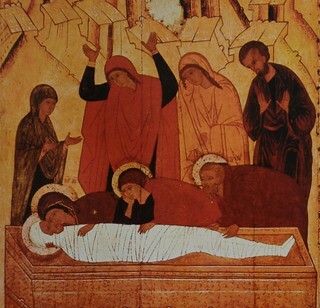 Christ sleeps on the cross in order to awaken us from the sleep of death and to awaken us from our having fallen asleep in the world when we should be awake, alert and vigilant. In Christ we awake from our sleep whether in this world or the world to come. In Christ dying on the cross we see God’s love for us undisturbed by the sin of the world, encouraging us to unite ourselves to Him so that whether we live or die we belong to the Lord. See also my post Arising From Sleep.